Idaho’s go-on rate apparently is going downward. That’s the startling, sobering message from the latest round of numbers from the National Student Clearinghouse. Forty-four of the Coeur d’Alene Charter Academy’s 53 graduates in 2013 are now enrolled in two- or four-year college. The academy is one of just six Idaho schools to meet a lofty State Board of Education goal: seeing 80 percent of high school graduates enroll in postsecondary programs within a year of getting a diploma. Just under 52 percent of Idaho’s 2013 high school graduates have enrolled in two- or four-year college, according to the current clearinghouse numbers. This represents a drop from Idaho’s lackluster 2012 numbers, when 54 percent of graduates decided to continue their education. The apparent drop comes as Idaho policymakers have made postsecondary attendance a centerpiece education issue. The current National Student Clearinghouse numbers represent a snapshot in time. The clearinghouse counts only students who have actually attended two- or four-year school, State Board spokeswoman Marilyn Whitney said. They do not include 2013 graduates who plan to attend school eventually, after entering the work force, serving in the military or completing a church mission. So the numbers will go up as students enroll in a four- or two-year school — and decrease when students drop out. And the dip in 2013 numbers may actually reflect an improving economy, State Board president Emma Atchley of Ashton said Thursday. High school graduates may be taking advantage of a strong labor market and going straight to work, perhaps to earn some money to attend college later. No matter how things ultimately shake out, the latest numbers still illustrate that Idaho has a long way to go to meet its long-term goals. The State Board’s strategic plan includes a lofty long-term benchmark: The board wants to see 80 percent of high school graduates enroll in postsecondary programs within a year of receiving a diploma. According to the clearinghouse numbers, obtained last week by Idaho Education News, only three charter schools and three small school districts have met the 80 percent threshold for 2013. Taken together, these six small high-achievers account for only 148 graduates — or .8 percent of the 17,143 graduates in Idaho’s collective class of 2013. A further analysis of the current numbers reveals more troubling signs. The go-on numbers appear to be backsliding in the state’s larger and more urban school districts — even those in close proximity to two- and four-year colleges. The state’s two largest districts, West Ada and Boise, comfortably beat the statewide average. Each sent more than 61 percent of their graduates to two- or four-year institutions. But both districts saw a dropoff — West Ada’s 2012 go-on rate was 70 percent, Boise’s was 64 percent. This backslide occurred despite continued growth at Boise State University and the College of Western Idaho. These decreases were by no means unique. According to the current figures, go-on rates declined at nine of the state’s 10 largest districts. Nampa, the state’s third largest district, held steady at 50 percent, slightly below the state average. The Madison School District, home to Brigham Young University’s Idaho campus, reported a dropoff from 57 percent to 38 percent — although Mormon Church missionary service would certainly contribute to the low attendance rate immediately following high school. The soft go-on numbers also coincide with a debate over rising tuitions at state-run and private universities alike. And the clearinghouse numbers suggest that college costs — or at least the sticker price of out-of-state or private institutions — are a significant factor in enrollment decisions. More than 6,500 high school graduates enrolled in Idaho colleges and universities. Fewer than 2,400 graduates enrolled out-of-state, or just under 14 percent of the Class of 2013. By a wide margin, public institutions were the destination of choice for college-bound grads. In all, 7,150 grads enrolled in public colleges and universities, while 1,726 grads — or just one-tenth of the Class of 2013 — chose private schools. More reading: Look up numbers from your local school at Idaho Ed Trends. 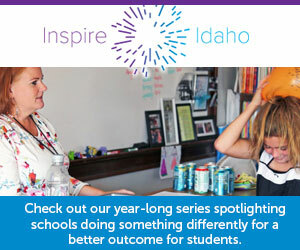 Disclosure: Idaho Education News is funded by a grant from the J.A. and Kathryn Albertson Foundation. When adjusted for inflation, Idaho’s college tuition and fees have increased more than fivefold since 1980, according to a new report from the Idaho Center for Fiscal Policy. About 73 percent of Treasure Valley graduating seniors said they planned to continue their education — yet Idaho’s go-on rates hover around 50 percent.